outside. 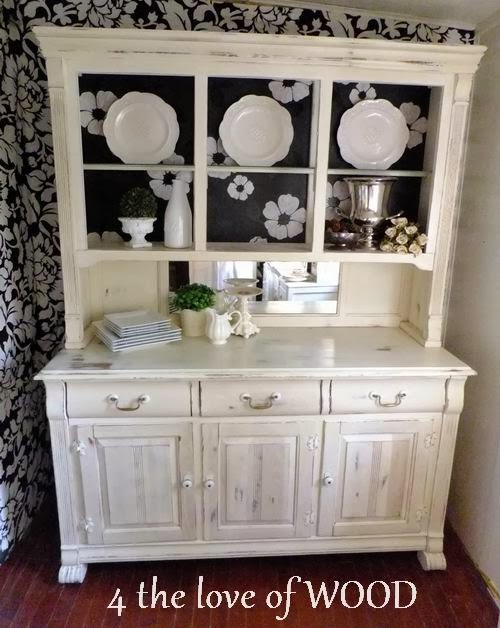 A friend had been trying to fill a dining room nook and this turned out to be the right piece. I sprayed the rest of the cabinet in ASCP Old White and added a black and white wallpaper interior. The aged oak did lovely things to the paint color and I get a nice shine when I buffed the wax. holding each in place and wallpapered them one at a time. Much easier than one large piece. The porcelain and brass knobs and handles are original but some parts were missing. When I took the doors off the top I was able to steal 2 of the porcelain knobs for the bottom. I'd like to do more china cabinets but we'll have to see how much space is available this winter.